Charlotte is almost 3 months now, and some days I feel like I've finally got a hang of this whole mom thing until 2.5 seconds later the unexpected happens. Well at least there was a split second when it seemed like the stars aligned just for me. It's really not that bad. I would say I have more star aligning moments than not, but I would be lying if I told you I didn't have any help. 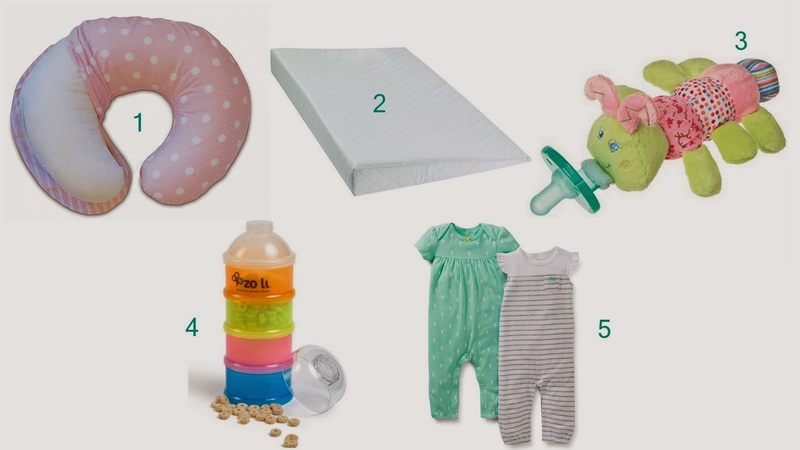 Below are my top 5 baby items that I couldn't live without. These are my lifesavers that help me through those rough days. The Boppy - She LOVES her Boppy. It's so nice to be able to put her next to me on the couch and interact with her. It keeps her slightly elevated which helps for spitting up and her reflux but is also comfortable enough for her to take a quick nap in. I like that these grow with your baby as well. Crib wedge - This is my newest purchase and it works wonders! We had Charlotte in our room for the first few months mainly for our convenience. She slept through the night in her Rock-n-Play and I wasn't about to change that routine. I knew she was going to outgrow the Rock-n-Play soon so it was time to face the crib. Just as I feared she kept waking up in the middle of the night. I tried rolling towels under her mattress to elevate it but she would roll off them and wake up with her face pressed against the crib rails (yeah, she wasn't a fan of that as you can imagine). After talking to a few people, I decided to try the crib wedge because it props her up like the Boppy and Rock-n-Play and is more stable than the towels. Sure enough it worked! Wubbanub - We love these! She has had them since she was born and they are great because they stay in their mouths a lot better than just a regular pacifier. Because there is a little stuffed animal on the end, it's easy for her to grab and keep it in her mouth. And can we talk about how stinkin' cute they look?! Formula stacker - When getting ready to go out for the day, it's so much easier to portion out 3 or 4 feedings than to bring the entire tub of formula. You can bring just one or screw on more containers for more feedings depending on how long you plan to be out. It has an easy pour spout so you won't make a mess trying to dump the formula in the bottle. One piece outfits - I always thought I would want my baby dressed to the nines at all times. That lasted for about a minute. I quickly learned that one piece outfits are your friend. I don't like the idea of leaving Charlotte in her jammies all day but I like the ease of the sleepers. So I went out on a mission to get as many one piece outfits that didn't look like pajamas to wear during the day. Sure, when we go out to see people I will dress her up more, but for errands and lounging around the house it's just not necessary. Linking up with Molly and Carly for Funday Monday! Now that I"m bringing CT to the sitter each day I'm all about one piece outfits. When I'm home with him I still like dressing him up. I got one of those wedges for free and am so excited to hear from someone who's used one. I'm glad it's helped out Charlotte!